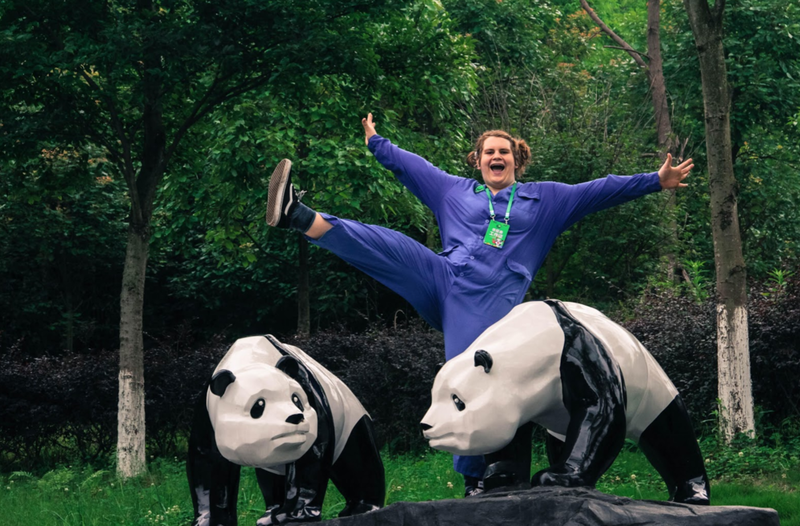 Through a lifelong love of pandas, many years devoted to studying Chinese and conservation biology, and a whole lot of luck, I earned a job guiding students on volunteer travel programs to China’s panda reserves. Check out this post to see how you too could become an adventure travel guide leading groups through companies like mine, and read on to discover what it would be like to live a day in the life of a panda guide! Wake up and run downstairs to the hotel breakfast room. Check in with co-leaders and students over a buffet breakfast of rice porridge and instant coffee. Make sure to remind students to wear long-sleeves, comfortable shoes, and tons of sunscreen before boarding the bus. Settle in for a long bus ride from outside Chengdu to the Wolong Giant Panda Breeding Center in the mountains of rural Sichuan. After catching up on some sleep, wake up to window views that will blow your mind: this part of China is home to some of the world’s highest peaks and untouched freshwater reserves. Wake everyone up to take a look, and then announce the daily itinerary and expectations. This is also when I share my personal story to the group on the bus. As a child living outside San Diego, I visited a panda cub named Hua Mei every chance I got. When she was sent to live in China, it became my ultimate dream to follow her there. Precocious and persuasive, I convinced my mother to use her savings to take me to China when I was twelve. We went to Wolong, found Hua Mei, and were her volunteer keepers for seven days. Little did I know at the time, the Wolong panda reserve I fell in love with would be destroyed only one year later by an earthquake in May 2008, and in the summer of 2017, I would find myself leading students to volunteer at the reconstructed reserve and would find Hua Mei again. Arrive at the newly reconstructed Wolong panda reserve, a sprawling mountain oasis, far from the tourist-ridden reserves near Chengdu and captured by an atmosphere and attitude of stillness. The air here is crisp even in July, China’s hottest month, and it is abundantly clear by the surrounding snowcapped mountains and bamboo forests that this is a panda’s natural habitat. Meet the volunteer manager in the lobby, sign waivers, and distribute panda jumpsuits and gloves to the group. Lead a quick game with the students to get them excited and focused, then hop onto a golf cart and ride to the assigned enclosure. Panda enclosures are divided into an outdoor “garden” and an indoor “house.” Volunteers should always be in the section the panda is not in. Typically, this means starting outside, where two students will be sent to do a perimeter sweep in search of panda poop, and the remaining students will scoop and sweep the bamboo scraps left by the panda from the day before. While it’s important to get the work done efficiently (especially because the keepers don’t want to do the volunteers’ work all over again), this is also a good time to take pictures of the crew and say hello to today’s panda, who’s seated just a wall away! After the keeper approves the garden cleaning, he or she will call the panda outside, and volunteers will move in to the house. The process here is similar, and I like to remind students to get down and dirty. It’s easier to pick up panda poop by (gloved) hands than by the scooper tool, and considering all they eat are vegetables and bamboo, the poop itself is really not that gross! Plus, there’s an amazing reward: after you clean, you can take turns feeding the panda by hand. After watching the cubs and playing another group game (I like to get students running around whenever we have the space for it, and Wolong is still empty enough that we pretty much have the run of the land there), head to the cafeteria for lunch. Opt in to eating with the workers so that students can practice their Chinese and learn about the local culture while chowing down family style. After eating, teach the group how to play Majiang (or Mahjong), a game that originated in Sichuan province! Pandas are pampered, so after they eat their lunch, they require volunteers to re-clean their enclosures before dinner. The afternoon shift is similar to the morning, but by now students know what they’re doing. They work faster, and if they’re lucky, they can spend the extra time learning how to break bamboo, visiting the on-site museum to learn more about the world’s most successful wildlife conservation effort, or shop for souvenirs from local vendors. Say goodbye to Wolong for the day and hop back on the bus. Stop for an hour on the way in Ya’an to visit the Sichuan Earthquake Museum, an open-air museum built around the preserved epicenter of the 2008 earthquake, a high school that sank into the ground. An estimated 100,000 people were killed by the quake and its aftershocks, and at least three times more displaced. This is a serious and difficult site to visit, but it is important for travelers of all ages to acknowledge an event that was as culturally significant to the region as 9/11 was to New York. After a shower break at the hotel, walk to a local restaurant for a Sichuanese delicacy: hot pot! “Hot” here refers to every kind of heat you could imagine, including temperature, spice, and even a special numbing pepper. Teach students how to properly (and carefully) cook their food in a vat of boiling broth before lathering it in sesame sauce and garlic. Head back to the hotel for a group debrief—or my personalized version of it, which includes some sweet treats: “dessircle.” In the dessert circle, check in on how students are feeling today before launching in to a discussion tailored to the group’s interest and maturity. This point of the trip is a great time to discuss what it means to volunteer, how to define culture, or ask a controversial question. My favorite: should the giant panda be saved? While the pandas themselves are irresistibly adorable, the best part of being a panda guide—or any adventure travel guide, for that matter—is seeing how days like this one impact the group. China is a mysterious place to most people, and it is really only through travel that we can even begin to understand it. Over ten years ago, I followed a panda to China and the experience changed the course of my life. I now have the best job in the world, because I get to return to my favorite place and watch how it continues to change lives. About the Author: Hailey Savage @hailssavage is a graduate student at Columbia University. When she isn’t studying, she works as a New York City dog walker and an international program leader for Rustic Pathways who enjoys backpacking the world through a digitally nomadic life. Some of her favorite places to visit are China, Italy, and her home country: Canada.